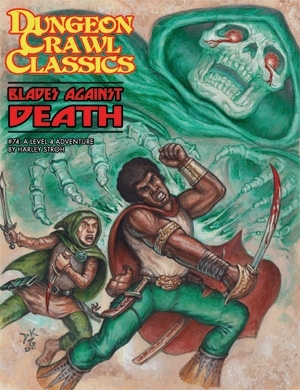 Blades Against Death, by Harley Stroh for Goodman Games, is one of the real gems of the DCC Trove of Treasures. This adventure, which takes place in the city of Punjar, gives PCs a chance to recover one of their own from the icy clutches of Death Himself. Not in a metaphorical sense, either. The adventure is written for 4th level PCs, who get to do fun things like infiltrate a cult and locate the Gates of the Underworld. While the adventure has the potential to be combat-heavy, even to the point of a TPK, it doesn’t have to be. The players are allowed to determine how they deal with what they encounter. Deciding to let "Bob" stay dead is a valid choice, but the bold and the lucky will risk more. Although not part of the DCC Lankmar line, this adventure screams “Lankhmar!” as loudly as anything I have ever read, for any game system. That’s not a knock against Michael Curtis’ releases, either – it’s a testament to the solid virtues of this gem. Along with The Jeweler Who Dealt in Stardust, in the Goodman Games Free RPG Day 2012 module, and reprinted in DCC #89: Chaos Rising, anyone interested in running a game based on Fritz Leiber’s iconic Nehwon should have this adventure in their judge's toolkit. Cast Tower of the Blood Moon Rises!